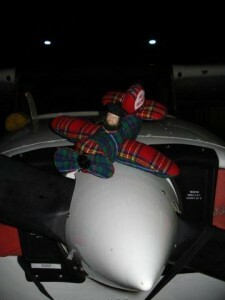 “Air Graeme” is pleased to announce the success of their first NIGHT cross country mission – flown from Providence to New Haven and back again during the late evening of January 31st, 2011. Completed at an average ground speed of 100 knots – the mission came in 2 knots faster than predicted with an elapsed time of 4 hours of which 190 mins was spent with the prop spinning. The unusual length of the total mission was because the first aircraft became unserviceable at start up and another had to be pre-flighted and brought out to the flight line. Notwithstanding this minor technical difficulty the mission was considered a complete success. Thanks to friend Sheri Miller for the “Air Graeme” mascot – she is talented with a needle and thread.